Jay A. Stout's new book, "Air Apaches" is now listed in our books section. Follow this link to order through Amazon. Vic Tatelman's book "Flying colors", written by Sarah Moore, is now listed in our books section. Follow this link to order through Amazon. Welcome to the 345th Bomb Group's Website. 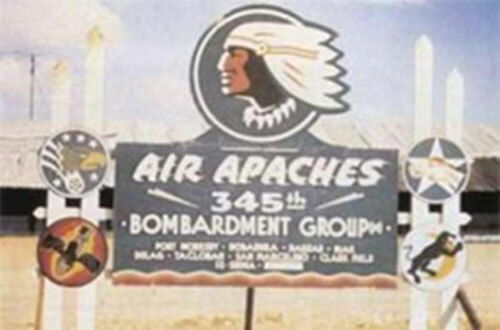 The 345th Bomb Group was first activated at Columbia Army Air Base, SC, in November 1942. The "Air Apaches" were the first full Air Force combat Group sent the Pacific in World War II and flew the B-25 Mitchell. Shortly after arriving in theater their B-25's were converted to "strafer's", making them a low level ground and shipping attack plane. The Unit was awarded four United States Distinguished Unit Citations and is one of the most decorated units of WWII. Read more about our Group here. "Recent News" has been updated on 02/25/2019. Past newsletters have been updated! Please contact us if you have newsletters from 2009 or 2014. The November 2018 Newsletter is now available here.